Xiomara, a Dominican American teen living in Harlem, is struggling to define who she is. Her twin brother, Xavier, is the smart one. He skipped a grade and attends a different, “smart” high school. Xiomara (See-oh-MAH-ruh) is lost in her journal, defending herself from the attention of boys, and running away from her mother’s religion. Xiomara’s teacher introduces her to slam poetry and invites her to attend a poetry club. But, it’s at the same time as her confirmation class so she doesn’t attend. Xiomara continues to write her thoughts, frustrations and passions in her journal. Xiomara meets a boy in Bio class, Aman, that she is definitely interested in. She sneaks away to the park to spend time with him. She reads him her poetry and she realizes that she is good at it. But, Mami, still expects her to attend confirmation class and be a good, religious girl. It all comes crashing down on her when her Mami finds out about her boyfriend and finds her journal. This award winning novel is told in poetry. It was an amazing audio experience. To hear the words is very different than to read them. And, if you do not speak Spanish it is much easier to listen so the words are pronounced correctly. 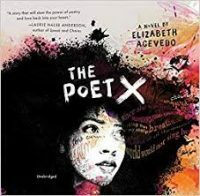 This book won the National Book Award for Young People’s Literature (2018) and the Michael L. Printz Award (2019).